It used to be, maybe still is, a custom among French farmers to decorate the rooftrees of their houses with glazed plaster animals. After my father won a literary prize in 1930, he treated himself to a year in France, and came home with this cat. For most of my life it climbed up the corner next to the fireplace in the living room of our house in Vermont. 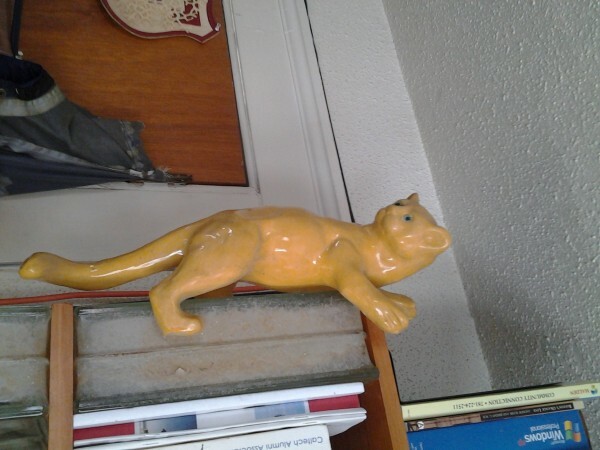 After he died in 1976, my brother & I cleared out the house, and I laid claim to the cat. It as since been climbing the bookcase in my rooms in Virginia & Massachusetts. It is much better behaved than the cats that occupy most Web postings. The last time a picture came out sideways, I remember it was a long agony to get it right side up. There are instructions, but I cannot follow them, because the button they tell me to click on is not in sight. Maybe your browser will allow you to rotate the picture ccw.